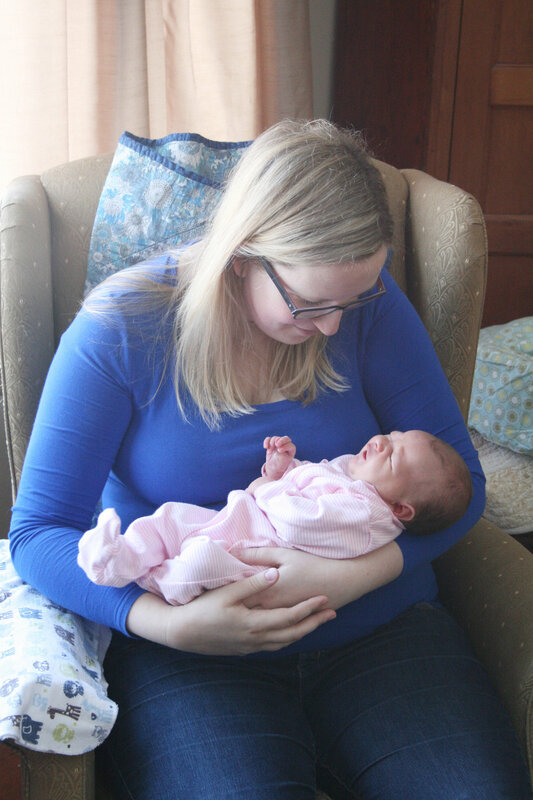 Holding Molly when she was only a few days old. There are so many positives! As a normally quite positive person, I do usually focus on how much fun Molly is, how funny she is, how great it feels to feel babies kick inside you, how amazing it is that she (and baby #2) are growing and safe. I know not every mother or would-be mother is so lucky. Despite all the trials and tribulations, my heart bursts with love for my family. I wouldn't say you can actually prepare yourself for the emotional and mental toll of parenting - it's a doozy! In fact, after finding myself pregnant the first time, I expected that in many ways my life "would be over" after the baby came. Ha! Not at all true, of course. There are many changes, but like most parents, I would not trade the new good bits for ANY of the old good bits. The part that for me came so unexpectedly is the physical toll on my body. My first pregnancy was not easy, although I was lucky to avoid any truly life threatening ailments. I was quite nauseous, exhausted, and developed sciatica which made even walking a few steps agonizing. Most of these ailments improved after birth, but I have struggled with physical health ever since Molly's birth. Lack of sleep, ongoing hip pain, heartburn, Celiac disease (not pregnancy's fault this one, but still a downer! ), a bunch of other more sensitive health issues followed me through the two years after birth, culminating in extreme dizzy spells that began this spring. After a battery of health tests came back negative, my doctor concluded that possibly the dizziness was from extreme lack of sleep. Let me tell you about sleep and I. I LOVE SLEEP. I often go to bed early and I still nap most days when Molly does. But the discomforts in my body coupled with our noisy dog who sleeps on the bed and some undiagnosed sleep apnea... I was waking up many many times a night to cough, check on the dog, listen for Molly, because I had actually stopped breathing/started choking (thanks sleep apnea), re-adjust the pillows to help my hip pain, take something for heartburn, and so on and so on. This resulted in my body basically ceasing to function and I could barely get off the couch without the room spinning or focus on the most basic things like people's names. In the middle of that, we were discussing and trying for another child. Unsuccessfully. I was having a lot of conflicting feelings during this period. I knew that I wanted another baby. I was terrified of having another pregnancy like my first. I was both very upset and a bit relieved every month when it turned out I wasn't pregnant. Again. I was so worried about my own health and whether it was actually completely irresponsible to have a baby while I could barely care for my current child or even myself. I was worried that if I waited until I was better, I might never get better or I might miss the chance to get pregnant at all. I fell twice from dizziness and had to go on sick leave from my job. We decided to stop trying for a baby until I was feeling better. Within a week or two I found out I was already pregnant. Again, so many emotions. I was so excited and I also sobbed my heart out from fear. Multiple times. I'm sorry to anyone who asked me how I was doing during this period, because I feel like I gave everyone completely truthful but drastically different answers. My sleep changed within weeks. The exhaustion and nausea of the first trimester had me napping up to 4 times a day and going to bed before 8pm. I went to two sleep studies where I was diagnosed with sleep apnea and prescribed a CPAP machine as well as a list of sleep changes to implement. Miraculously, the dizziness mostly disappeared. Of course, it was replaced with vomiting, nausea, extreme aversion to smells and foods, and exhaustion... but as terrible as those are, they aren't as deeply worrying as unexplained and chronic dizziness. It's still not clear if it was the sleep changes or the pregnancy hormones/changes that fixed the dizzy spells. I do still occasionally feel dizzy, and I worry that it will come back. The first trimester symptoms that disappeared at 12 weeks with Molly lasted until 16-18 weeks. I am still gagging every morning when I brush my teeth now at 21 weeks. At 18 weeks I started bleeding and cramping. They found some disturbing stuff during an emergency ultrasound. The good news is that the baby is fine (and a boy!). The bad news is that in order to keep everything fine, I need to avoid doing anything that makes the bleeding and cramping worse - which turns out to be everything! Actually. Like standing to make dinner can set it off. So until further notice I am resting. A combination of Jay, my mom, and Jay's parents have been saving my life by coming every day to play with and feed Molly (thank you, thank you, thank you!). Jay has taken on the majority of the housework (although my mom helps when she is here, too - thanks mom!). There are still many months to go. Where does that leave me now? I am worried. I am in pain. I have boat loads of guilt about how much TV Molly is watching when I am in charge of her, and how we don't spend our days adventuring together anymore. I am bored - I bought a whole bag of yarn a week and a half ago and already knit it all. I am excited for this baby boy - and every time he kicks I get emotional because he's still okay in there, despite everything, and I can't wait to meet him. I'm upset that it always feels like my body is failing me. I am afraid of the unknown remainder of this pregnancy and how it might progress. I am a combination of grateful and embarrassed about how much help I need right now - and how much help has been offered. I feel vulnerable, posting all my weaknesses on the internet. But I also feel good about it. Life is messy and imperfect and raw. I am messy and imperfect and raw. For some reason, I find explaining my current conditions in person to be nerve wracking and upsetting, but a blog post to the universe feels a bit more manageable. (I know, it makes no sense). Maybe my story will even help one of you, or inspire you to make a doctor appointment about one of the little things that has been bugging you or disrupting your sleep. My biggest lesson this year has been about self care. I've been forced to take major steps back, choose my priorities, take life a bit at a time, and enjoy the small moments of each day. I've had to let go of control, face letting people I love down on a daily basis, and accept help from those same people.